A group of Jews from both religious Jewish communities in Edinburgh and unaffiliated Jews has come together to initiate activities to support refugees arriving in Edinburgh. They are particularly interested in private sponsorship for refugees. With the agreement of the governing bodies of Sukkat Shalom and the Edinburgh Hebrew Congregation, ‘Edinburgh Jews’ have signed up to become a sponsor. 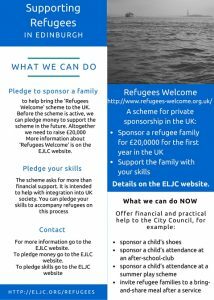 The goal is to reach £20,000 in pledges to be able to support a family of refugees for a year, as soon as the scheme is activated. If you would like to make a pledge or to donate, please email nick_silk@btinternet.com. World Jewish Relief is the UK Jewish community’s international humanitarian agency. They are working to support Syrian refugees in the UK. The Jewish Council for Racial Equality has campaigned on refugee and asylum issues for many years.Their website is www.jcore.org.uk. They have also helped to set up the Support Refugees pages, which give a wide range of information and ideas. Ephraim Borowski, Director of the Scottish Council of Jewish Communities, gave this ‘Thought for the Day’ on BBC Radio Scotland, 2 October 2015.
led to freedom by Moses. The festival of Passover recalls the Exodus itself, when the tribe of Israel became the Jewish nation, and Sukkot, which we are observing this week, commemorates the 40-year journey home, wandering in the wilderness, relying on miraculous supplies of food and water, with a pillar of cloud as their satnav, and living in makeshift shelters. That’s why many Jewish people at this time of year build a ramshackle hut in their gardens, or even precariously balanced out of their tenement windows, where they eat, and some even sleep if the weather allows. If your neighbours do this, please don’t demand planning permission – it’ll be gone in a week! The point is to forego the comforts of home to remember the precariousness of being a refugee, taking that risk because the uncertainty of surviving the exodus was preferable to the certainty of extinction if they stayed behind. For me that was echoed in one of the many tragic stories from the current crisis, of the Syrian surgeon whose wife and daughter had drowned, but who still said that it had been rational to take that risk. We went as migrants to Egypt; we escaped as refugees from Egypt; we were exiled again by the Romans. My mother’s family came to Glasgow to escape pogroms in Russia, my father to escape the Holocaust. And nearly every family in Scotland has a story of migration, from the Vikings, the Angles, and the Normans to the Irish, the Asians, and the Eastern Europeans. Who are we to close the door behind us? It’s not “There, but for the grace of God, go I”, but “Here, by the grace of God, came I”.